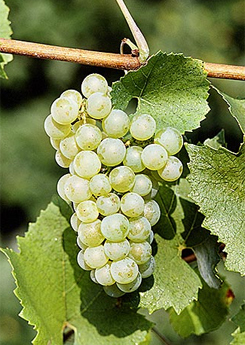 Chardonnay is world’s most famous white wine grape variety. It is grown worldwide from England to New Zealand because of its “low maintenance” feature, it easily adapts well to a variety of climates, though initially it was originated in the Burgundy wine region of eastern France. At this point the wine is produced in extremely high yields all around the world; these yields are then transformed into millions of bottles of Chardonnay wines. It is one of the most commonly planted grape varieties with over 160,000 hectares worldwide, in more regions than any other. It is easily available at any state store as well as local grocery store and wine store, although all are in different styles and prices. “Rich” is the word that perfectly describes Chardonnay. It comes in an impressive range of flavors; it might smell like apples, lemons, peaches or tropical fruits. It completely dominates its aroma and flavor, the buttery taste comes from fermentation of oak, the idea is to add some oak characteristics in the wine, along with allowing the wine to develop its mellow texture, which gives it a pale straw or gold color and not clear white. Winemakers also toast the inner side of the barrel, giving it a smoky oak or toasty flavor. Aging the grapes in oak gives the final product a hint of spice with an aroma of vanilla or coconut. If you like the smooth buttery style, you should look for the ones that have been through malolactic fermentation; this term is best associated with Chardonnay. It is the process of taking the malic acidity in wine and translating it into a softer and milder lactic acid. Malic acid is found in smith apple and lemon whereas the lactic acid is found in milk and butter. A wine that undergoes this procedure is less acidic in nature, with a diminished fruit character. Some on the other hand prefer to use no oak, which gives it a clear color and crispier flavor. Due to its style and versatility, Chardonnay has the potential to be paired with roasted chicken and other white meats such as turkey and smoked fish along with spicy southeastern Asian Cuisine, garlic and guacamole dips. Also consider pairing it with pork or other recipes that have a heavy cream or butter base. Style that is characterized by maintaining more acidity is usually paired well with tomato-based dishes and dishes that feature sweet onions; on the other hand the one with a very mellow taste is paired with mushroom soup or dishes that feature cheese. Chardonnay is the perfect drink for outdoor dining during summer.